Windows 8, the package for the common consumer and their PC. Windows 8 Pro, for those who want those extra features like file encryption, and the ability to host with the new Remote Desktop feature. Windows 8 Enterprise, yes, only available to enterprises, is Windows 8 Pro with a few extra IT security and network management features. Windows RT, short for Windows Runtime, refers to the new ability to, in short, run all your Windows 8, non-x86 apps, with a tablet-friendly, though still feature-rich, version of Windows. What does this mean for the consumer? Microsoft’s goal is to make the answer to that question “not much”. The idea is that the experience of Windows 8 is constant between all the different devices and places which the new interface is seen and used. Problem is, this interface is completely new in the PC world, and to most people, the new Metro design is foreign. Aside from those using Windows Phone 7, Metro is a whole new design language to learn. Nonetheless, the world will learn all this fast if it gets in the hands as many people as have Windows 7 now. As for the SKU titles, the average Joe doesn’t need to know the difference, and Windows RT will likely be marketed as simply as Windows on a tablet. One of the main concerns is the customizability of the OS. (No, I don’t think that’s a word.) 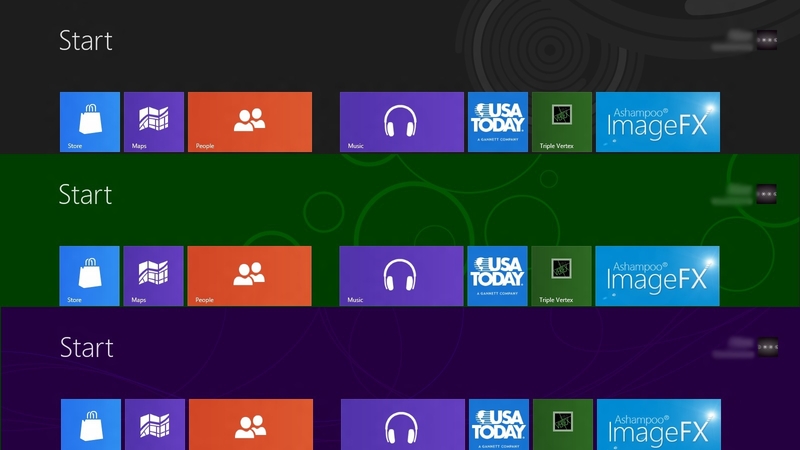 While the traditional “Desktop” may be customized traditionally, the main Start screen is limited to a few designs and 9 colors. Three combinations are shown below. Does this look customizable to you? Another burning question is what Windows 8 means for enterprise. With a specialized SKU of the OS, Windows 8 Enterprise, Microsoft is obviously serving to the needs of the businesses of the world. Jeffrey Sutherland for the Building Windows 8 MSDN blog recently described plans for allowing non-company computers (buy-your-own, or BYO) to easily access a company’s programs and resources via a WOA management client (check it out at http://blogs.msdn.com/b/b8/archive/2012/04/19/managing-quot-byo-quot-pcs-in-the-enterprise-including-woa.aspx). This means a company could allow employees to connect securely to an infrastructure of tools to work cooperatively, or a hospital could allow patients to log in and access apps or resources, such as a survey. (Yes, that was all you, Lowdermilks on the Metro Developer Show.) It’s features like these that could really make tablets on Windows 8 beneficial to business. The revamp of the OS is significant, and it’s going to take a while for many to familiarize themselves and adapt, but in the end, I personally believe that the new graphics-focused UI, and the effort Microsoft is making to make Windows modern, will pay off. That’s my verdict. You’ll probably also want to see our Windows 8 gallery.